series of face-to-face meetings with leading media members. The Internet, newsstands and airwaves contain a virtually endless supply of content devoted to auto enthusiasts of all stripes. It’s here where everyone from average daily commuters to tech-savvy gearheads encounter AMSOIL products and messaging, often for the first time. Unlike most multi-level marketing companies, AMSOIL INC. helps Dealers by strategically placing advertisements in popular magazines, including Mopar Muscle, American Motorcyclist, Diesel Power and more. AMSOIL also cultivates lasting relationships with editors that can result in articles mentioning AMSOIL products. This investment, now growing to include websites and television shows, initiates a rapport with enthusiasts that often culminates in them becoming loyal AMSOIL customers. Participating in the annual Motorsports Parts Manufacturing Council (MPMC) Media Trade Conference in Los Angeles, Calif. has gone a long way toward increasing the visibility of AMSOIL in the media. The MPMC is an arm of the Specialty Equipment Manufacturers Association (SEMA), which has grown to more than 6,000 member companies worldwide. The annual SEMA convention and trade show during the first week of November is one of the largest in Las Vegas, as well as a Mecca for performance auto enthusiasts. Held every January, the MPMC conference provides a venue for 100 of the top SEMA manufacturers to meet with national media away from the glitz and glamour of the SEMA show. This year, AMSOIL INC. was represented by Director of Advertising Ed Newman and Technical Powersports Product Manager Len Groom. Over the course of three days, Newman and Groom participated in 41 different 30-minute meetings with publishers and editors representing magazines that cover Corvettes, Mustangs, Mopar and GM muscle cars, diesel trucks, off-road racing, street rods, import tuners, classic trucks and more. A large contingent of editors from websites, including fordmuscle.com and streetperformance. com, also attended. The meetings allowed Newman and Groom to introduce new AMSOIL products, including Dominator ® Coolant Boost, OE Synthetic Motor Oil and European Car Formula 5W-30 Synthetic Motor Oil, which receive coverage in the “New Product” sections of many of these enthusiast magazines. Just as important as showcasing products, the meetings often help provide editors with the knowledge they need to write future articles. For example, the tiered-surfactant technology behind Dominator Coolant Boost can confuse those unfamiliar with how it works. Talking with Groom, one of the people responsible for its formulation and testing, allows editors to clearly understand the market demand for the product, how it works and why it outperforms competing products. Editors can then craft an article from the information, often including references to AMSOIL. In this way, readers develop an understanding of the challenges posed to automotive cooling systems and the technology available to improve performance. It’s meetings like these that make the annual MPMC conference valuable to AMSOIL and its Dealers. Collaborating with automotive magazines and websites prepares their legions of dedicated readers to respond positively to AMSOIL products when meeting a Dealer for the first time. In addition to deepening existent media relationships, Newman and Groom also had multiple opportunities to present those not as familiar with the company the story of how Lt. Col. Albert J. Amatuzio introduced synthetic lubrication technology to the auto industry. 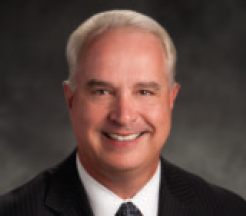 This marked the fourth straight year of AMSOIL involvement in the MPMC Media Trade Conference, and the benefits become more apparent as an increasing number of editors and publishers seek to establish relationships with AMSOIL. MPMC is just one more way AMSOIL spreads the word and helps Dealers build their businesses. Don’t try to be everything to everyone. Becoming a specialist can increase sales. There are three things that every good AMSOIL Dealer needs to know: how to offer the right product for the right application; who his or her customers are and why customers purchase AMSOIL products from him or her. This column will address the second point: knowing your customers. To whom are you offering AMSOIL products and your services as an AMSOIL Dealer? Let’s start out with the wrong answer: “I offer AMSOIL products to everyone.” Business professionals who market their services to everyone don’t understand a critical truth of business today – clients want to work with specialists and experts. If you wanted to hire a lawyer to handle a licensing matter, would you prefer an expert attorney who handles licensing issues on a regular basis, or one who also “happens” to provide licensing advice? Both attorneys may have the same type of training, but one has become focused on the area of licensing. Doesn’t that make him a more appealing choice? The key is to target a specific market or two with AMSOIL products. That isn’t to say you should limit your services to only those customers who fall into your specialty market – you can still sell AMSOIL products to anyone who wants to buy them – you just focus your efforts on a particular group. It might seem as though you are limiting yourself, but by specializing you make yourself more visible to your target market. For example, if you specialize in powersports applications, powersports enthusiasts are more likely to find you. Most powersports enthusiasts have lubrication needs in other areas too, and could provide additional, non-powersports sales opportunities. 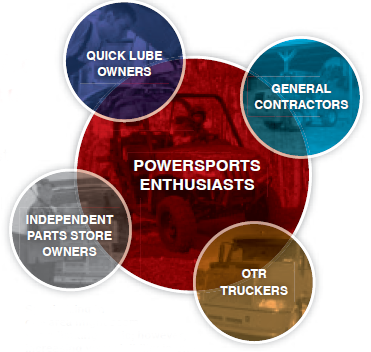 A certain percentage of powersports enthusiasts are also general contractors; some are independent parts store owners; others are truckers; all of them present great opportunities for sales outside your specialty market. By specializing, you will attract your ideal client, but you will also attract people from other walks of life. Some of those people may even ask you to “make an exception” and work with them. For example, let’s say you inform someone who owns a beverage delivery fleet that you specialize in helping overthe- road trucking companies maximize their fleet’s fuel economy and reduce the amount of time their trucks are in the shop. Any fleet owner knows that translates to cost savings for the company. Do you think the owner of the beverage company might ask you to “make an exception” and work with him and his fleet of gasoline vehicles? He just might. Once you find your niche, you will want to form long-lasting relationships with your customers. You will want them to provide compelling testimonials in the future, so some thought and effort must go into what you do to foster the relationship and make them feel special. Here are some ideas; use those that work for you. Specializing in one area might seem like a limiting tactic; however, increasing your visibility in one market can also increase your opportunity for sales in other areas. Reward your customers for being your customers. Randomly surprise them with a reward. It will go a long way, believe me. Listen to every little detail they say. When you talk to them next, ask how their holiday went, ask if they have anything planned for the weekend, ask how their kid did in his last sporting event. Show an interest in your customers as people. Cater to their every need. If you know they require a service over and above what you can normally provide, make an effort for them. Show that you care about them. Give them some publicity. If they are a great customer and there is an opportunity to shout about your relationship, tell everyone you know! Let them assist in shaping the service you provide. Don’t just ask for feedback and hope they give you something you can use; speak to your customers and ask them how their experience could be improved – ask their advice. Engage without trying to sell. Even when you know it is unlikely they will need AMSOIL products again anytime soon, get in touch just to keep the relationship alive. Call your customers by name. I know this sounds obvious, but every time you are in contact, whether face-toface, by phone or online, start off the conversation by using the customer’s name. Refer them to others who can also help them. If you can’t solve their problem, pass them onto someone who can. Make solving their problem your number-one aim. So, when someone asks what you do, don’t be afraid to identify your area of expertise; it will help you stand out from the crowd. Who wants to be everything to everyone anyway? Automakers continue building vehicles that produce substantially more horsepower, torque and towing capacity than their predecessors, yet the gears and bearings responsible for converting this increased power into wheel rotation remain largely unchanged. To reduce drag and improve fuel economy in some vehicles, engineers have also reduced the volume of gear lube available to cool and protect. The 1996 Ford F-250 Crew Cab, for example, features a 10,500-lb. maximum towing capacity using a rear differential that holds 3.75 quarts of gear lube. The 2011 Ford F-250 Crew Cab, meanwhile, boasts 14,000 lbs. of maximum towing capacity despite a rear differential with a smaller, 3.45-quart capacity. Increasingly, synthetics are relied upon to meet these higher demands. Some manufacturers now recommend synthetics in the differentials of certain newer vehicles, such as the Chevrolet Silverado and Ram pickup. The heightened awareness of synthetics presents AMSOIL Dealers with great sales opportunities, especially when considering other lubricant manufacturers spend little effort marketing their gear lubes. Differential designs come with inherent suffering points, and it’s here that synthetics prove their worth. 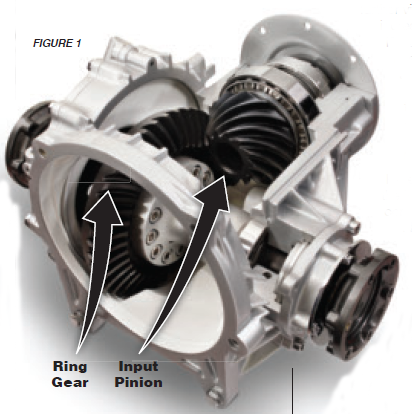 In a traditional automotive differential (Figure 1), the input pinion gear concentrates intense pressure on the ring gear, forcing it to turn the side and spider gears. As all the gear teeth mesh, they slide against one another repeatedly, separated only by a microscopic film of lubricant. The constant stress the lubricant film bears can shear lesser gear lubes, causing permanent viscosity loss. Once sheared, the fluid film weakens, ruptures and allows metalto- metal contact, leading to increased friction, accelerated wear and eventual gear and bearing failure. The composition and characteristics of synthetics play a vital role in wear reduction, an area in which AMSOIL synthetic gear lubes excel. Conventional lubes formulated with viscosity index (VI) improvers shear more readily under stress. AMSOIL synthetic gear lubes, however, maintain viscosity better than other conventional and synthetic gear lubes despite rigorous use and contain advanced anti-wear additives for further protection. Severe-service applications used for towing, hauling, 4×4 off-road driving and commercial use place even greater stress on gears and bearings. Many drivers operate under severe-service conditions without even knowing it. The sliding motion and pressure on gears can wipe the lubricant away, particularly in spiral-cut hypoid gears. AMSOIL Severe Gear® Synthetic EP Gear Lubes contain extreme-pressure (EP) additives that form a durable iron sulfide barrier on gear and bearing surfaces to guard against metal-to-metal contact in the harshest driving conditions. Differentials have always run hot, but increases in power and torque coupled with reduced fluid volume and reduced airflow due to improvements in vehicle aerodynamics only worsen the problem. Testing has shown applications simulating trailer towing at 88 km/h (55 mph) at a 3.5 percent grade can experience differential temperatures as high as 188ºC (370ºF). Those readings could be even higher using today’s more powerful vehicles. As temperatures in the differential climb, gear lubricants tend to lose viscosity, while extreme loads and pressures can break the lubricant film, causing increased metal-to-metal contact and heat. The increased friction and heat, in turn, cause the lubricant to lose further viscosity, which further increases friction and heat. Friction and heat continue to spiral upward, creating a vicious cycle known as thermal runaway that eventually leads to greatly increased wear and irreparable equipment damage. Here again AMSOIL synthetic gear lubes outperform conventional gear lubes. Not only do they resist viscosity loss due to mechanical shear, they resist thinning at high temperatures better than conventional lubes. In addition, the deposits conventional gear lubes leave behind coat gears and bearings, inhibiting heat transfer and shortening their life spans. What’s more, the lubricant thickens, increasing internal drag and reducing fuel economy. AMSOIL synthetic gear lubes, however, are engineered in a lab and contain only uniform molecules less prone to volatilizing at high temperatures. As a result, they not only resist thinning in heat to provide better cooling and protective properties, they stay fluid in cold weather to ensure immediate start-up protection. Their uniform molecules also reduce friction, effectively reducing drag and increasing fuel economy. Following the original equipment manufacturer (OEM)- recommended differential drain interval using the OEMrecommended fluid can get very expensive. A 2006 Dodge Ram 1500 (see example below) requires a differential fluid change every 15,000 miles if driven under severe-service conditions, which includes towing, short trips of less than 10 miles and use where temperatures are below 32ºF. AMSOIL Severe Gear Synthetic EP Gear Lube is recommended for 50,000 miles in severe service. Its use in this example saves over $220. In addition, synthetic gear lubes recommended by OEMs are often more expensive. The lower cost of AMSOIL synthetic gear lubes combined with their extended-drain capabilities and superior performance and protection make them the ideal choice. Specifically engineered for high-demand applications, including trailer towing, heavy hauling, 4×4 off-road driving, commercial use and racing. Superior film strength combined with extra additives protects gears and bearings from scoring and wear. Resists high heat and possesses excellent cold-flow properties. Outperforms conventional gear oils. Recommended for all types of vehicles such as turbo-diesel pick-ups, SUVs, autos, trucks, heavy equipment and motor homes. Compatible with most limited slip differentials. Specifically engineered for drain intervals up to 500,000 miles as set by equipment manufacturers for over-the-road trucks. Protects against wear and improves equipment life. Excellent all-season summer and winter performance. Outperforms conventional gear oils. Also excellent for passenger cars and trucks. Compatible with most limited-slip differentials. High-quality replacement for applications specifying SAE 80W-90 conventional gear lube. Synthetic construction provides improved cold-flow properties, high viscosity index, high heat resistance and excellent wear protection. High-viscosity, extreme-pressure gear lube engineered for the demands of severe racing conditions, including off-road truck racing, rock racing, rock crawling, tractor pulling, funny car racing and dragster racing. Protects gears from shockloading and tire shake. Resists sling-off from G-forces and high speeds. Effectively clings to gears, promoting cooler operating temperatures and extending gear and bearing life. Hydraulic Systems Hydraulic systems can look complex and intimidating, but most are relatively straightforward, consisting of a sump, a pump, hoses, valves and either pistons or hydraulic motors. Sump – The hydraulic system’s sump is responsible for holding the oil, providing time for the transferring of heat, and a place for contaminants, including water, to settle. Pump – The hydraulic system’s pump produces the fluid flow that creates pressure. In most cases, it is the most expensive part in the system. Hydraulic oils are subjected to pump tests to prove their ability to protect pumps under normal operating conditions. Hydraulic systems can have many different types of pumps, but the three most common are gear, vane and piston pumps. Gear pumps are often found on lower-pressure systems and are relatively simple and reliable. As positive displacement pumps, they pump a fixed amount of fluid for every revolution. Although variations exist, a good example is an automotive oil pump. Vane pumps are common on mobile equipment and can be variable or constant displacement. Piston pumps can be found on higher-pressure applications and are more complex and sensitive to contamination than vane or piston pumps. Hoses – Hoses carry hydraulic pressure and flow to various components, and are perhaps the weakest link in any hydraulic system. Maintenance is often ignored until a problem develops. Hoses fail due to heat, cold, repeated flexing, physical damage and exposure to the elements. Because they are notorious for failing, hoses present a significant challenge to selling customers a premium synthetic hydraulic oil. Many customers do not want to pay a premium price if they believe they will eventually lose most of the oil through a hose failure. Valves – Valves control the route of the hydraulic flow within the system, sending flow and pressure to components in order to operate them. Pulling a lever back may route fluid to one side of the hydraulic system, causing it to extend a piston, while pushing it forward may cause it to retract. Varnish presents a major problem with valves, causing them to stick or not allowing them to seal properly. Pistons/Hydraulic Motors – Pistons and hydraulic motors convert the hydraulic flow and pressure into work. 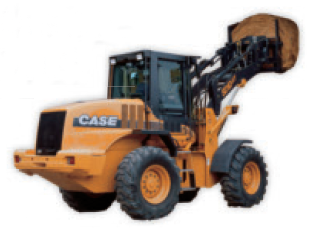 Pistons provide linear motion, allowing bulldozer blades to lift and backhoe buckets to tip, while motors convert hydraulic flow and pressure into rotational force, allowing drills to operate. Common issues associated with pistons and hydraulic motors are internal or external leakage. External leakage results in loss of fluid and possible contamination issues, while internal leakage results in lost efficiency. For example, a bottle jack with its valve only partially closed requires furious pumping to lift an object off the ground and won’t be able to keep it there. Zinc-containing hydraulic oil is a commonly-used hydraulic fluid, while other applications call for zinc-free hydraulic oil, motor oil or transmission fluid. Hydrostatic hydraulic oil is required when the fluid must also operate the hydrostatic transmission, biodegradable hydraulic oil is often required in environmentally sensitive areas and some applications require fire-resistant hydraulic oils. Each type of hydraulic oil has unique characteristics, and it’s important to understand what’s required for specific applications. The equipment’s operator’s manual will usually recommend viscosities for the ambient temperatures the machine is operated in or could even recommend a specific oil brand. 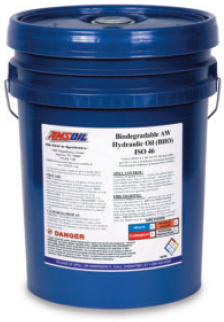 Dealers can use this information to recommend the appropriate AMSOIL synthetic hydraulic oil. When in doubt, contact AMSOIL Technical Services at 715-399-TECH. Hydraulic Oil Problems Heat and contamination present serious challenges for hydraulic oils. If the system becomes too hot, the oil’s viscosity can thin to the point where the pump is damaged or seals are destroyed. Because conventional hydraulic oil is often less expensive than synthetic hydraulic oil, it is important to emphasize the benefi ts and cost savings AMSOIL synthetic hydraulic oils provide customers. Heat Reduction – The synthetic construction of AMSOIL synthetic hydraulic oils can reduce heat in hydraulic systems, leading to better viscosity retention, less varnish build-up and oxidation, reduction in component wear (including hoses), longer seal life and better overall system performance. Cold-Weather Performance – AMSOIL synthetic hydraulic oils have much better cold-temperature characteristics than many petroleum oils. This can be demonstrated to potential customers by comparing the viscosity index, Brookfi eld viscosity and pour point numbers of their conventional oil to the corresponding viscosity AMSOIL synthetic hydraulic oil. Because mobile equipment generally sits out in the elements while on a job site, conventional hydraulic oils can thicken in the cold and lead to damage such as excessive pump wear due to cavitation, blown hoses, broken shafts or extended warm-up times that waste fuel. Use of the proper AMSOIL synthetic hydraulic oil viscosity helps reduce or eliminate many of these issues. All-Season Functionality – To eliminate some of the problems associated with temperature changes, many mobile equipment owners switch viscosities with the seasons. They may run an ISO VG 22 viscosity oil in the winter and switch to an ISO VG 32 or 46 oil in the summer. AMSOIL synthetic hydraulic oils are highviscosity- index formulations that can eliminate the need for seasonal changes. It’s very possible to run an ISO 32 or ISO 46 successfully yearround in all but the most extreme cold conditions.
. This is usually the most significant obstacle to overcome when trying to sell a premium hydraulic oil to an account. To counter this mindset, fi rst determine why they lose hoses. If they mainly get snagged, chafed or damaged externally, they will continue to lose hoses until they physically remedy the situation. However, if the hoses and seals are blowing in cold weather or because of deterioration, AMSOIL synthetic hydraulic oils can help. Cold and heat wreak havoc on hoses and seals. Cold, thick fl uid can cause pressure spikes and extremely hot fl uid breaks down hoses and seals over time. The superior cooling and fl ow properties of AMSOIL synthetic hydraulic oils help preserve hose integrity. AMSOIL Synthetic Anti-Wear Hydraulic Oils effectively inhibit oxidation to help prevent acid formation and viscosity increase, resist carbon and varnish deposits and inhibit rust and foam (providing smooth hydraulic operation). They contain a very effective zinc-based anti-wear/antioxidant additive which controls wear in high-speed, highpressure vane and gear pumps while meeting the lubrication requirements of axial piston pumps with bronze-on-steel metallurgy. AMSOIL Biodegradable Hydraulic Oil (BHO) is a premium-performance hydraulic oil that exhibits high biodegradability and low aquatic toxicity, along with superior oxidative stability, excellent low-temperature performance and outstanding results in laboratory and extended duration pump testing. It contains antioxidants that prolong oil life and foam inhibitors that help promote problem-free operation. Improve teamwork through face-to-face contact with personal group members. 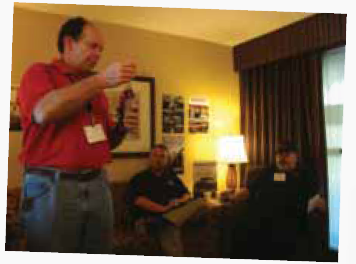 AMSOIL University provides the ultimate face-to-face AMSOIL Dealer training. Any coach will tell you that teamwork is the key to success, whether on the gridiron, the court or the diamond. The same can be said of building a successful independent AMSOIL business. Sales define success for any business, large or small, so it only stands to reason that a company that provides and encourages quality sales training is going to stand out as a leader in its industry. I am proud to say that AMSOIL most definitely falls into that category. The key to good training is a positive attitude. Train “attitude first,” and start with yourself – lead by example. Be enthusiastic. Lead rather than manage. Show your team how to do something as opposed to telling them what to do. Face-to-face contact with your team is the best way to build a lasting relationship with team members. One way to accomplish this is by conducting regular Dealer meetings. If you hold Dealer meetings, make them fun and upbeat. Be sure to recognize anyone who has reached a new level of achievement. 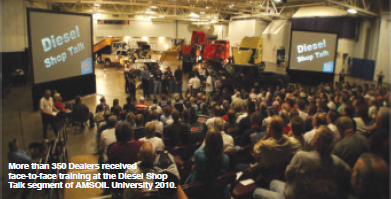 More than 350 Dealers received face-to-face training at the Diesel Shop Talk segment of AMSOIL University 2010. Encourage team members to share their success stories, but also allow frustrations to be shared and make time to provide solutions to those frustrations. Spend some time on product knowledge and sales strategies. And even though you’re the trainer, don’t be afraid to let members of your team brainstorm ideas and have a hand in the training. By showing that you value and respect their input, members of your team will be more likely to embrace your instruction. Working trade shows can be another prime opportunity for face-to-face training. If you’re exhibiting at a trade show, encourage members of your team to work the booth with you. What better on-the-job training can you provide than showing firsthand how you connect with prospects? You could also allow a member of your team to tag along on one of your sales calls. If that’s not an option, encourage your team to role-play some sales scenarios. If you have a video camera, you may want to record those role-playing segments. Video can be a useful tool in determining what and what not to do. All of these training examples will help build stronger relationships with your team members and encourage teamwork. While face-to-face communication is clearly the most effective way to train your team, it is not always possible. The important thing to remember is to connect with your team however and whenever possible. 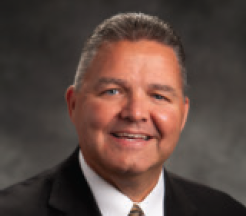 Many successful Dealers send out a monthly newsletter; others conduct live teleconferences. It may be as simple as sharing ideas via email or making a phone call to encourage accessing the Dealer Sales Training Tab in the Dealer Zone. AMSOIL is preparing now for its most important Dealer training event of the year and your opportunity for some face-to-face contact with corporate staff, AMSOIL University. If you’re serious about being a team leader, plan to attend AMSOIL U and encourage members of your team to do the same. This is your chance to lead by example, get to know your team better and demonstrate that you are still dedicated to training. Not only that, but it just plain works. Dealers who attend AMSOIL U greatly improve their odds of reaching the level of Direct Jobber. AMSOIL prides itself in the many sales tools provided to help you build your business. We encourage you to take advantage of these tools and make training a big part of your business-building process. Remember, AMSOIL University is this company’s most important training event of the year. There is a commitment of time, travel and expense, but consider those commitments a sound investment in your future (an investment that can potentially be written off on your taxes). AMSOIL U is rapidly approaching, but you still have time to get on board.